What Should I Do If I Receive A Formal Dinner Invitation? Have you recently received a formal dinner invitation? If the answer is yes, consider this an honor and make sure you do what it takes to stay on future guest lists by learning what is expected. 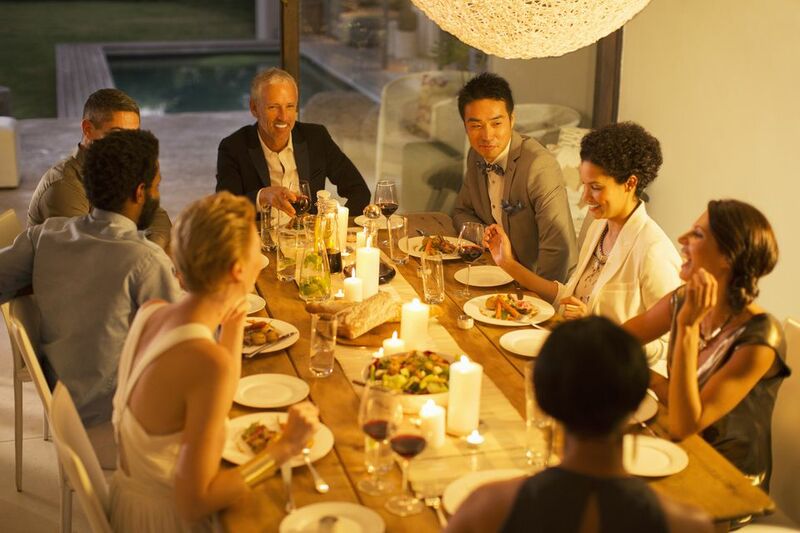 Most of us have received invitations to outdoor barbecues, potluck dinners, and casual get-togethers with friends. It's often through a text message or phone call. A formal dinner invitation is typically on nice stationery and arrives in the mail. Formal dinners aren't as common as they once were, so make sure you brush up on table manners for formal dining. Your attention to good manners will earn a special place in your host's heart. I just received an invitation to a formal dinner party and I don't know the hostess very well. Please list some helpful tips on what to do next. Whether you have been asked to attend the formal dinner hosted by a friend or feel obligated to go to one for business purposes, you need to follow proper etiquette guidelines for accepting or declining. While you might look at it with dread, particularly if you have no experience with formal dining and are worried you might make a fool of yourself, try to think of it as another fun social experience. The big differences are that you'll need to dress up a bit, follow all proper table manners, and know which utensil to use. Check your calendar to make sure you don't have any conflicts on that day or at that particular time. Respond to the host with an RSVP in precisely the manner you are asked to. There was once a time when it was handled by mail, but now some hosts prefer an email or "accept" or "decline" through an invitation site. Don't be demanding about what kinds of foods you like. However, it is okay to let the host know if you have any serious allergies. If you are friends with the host, ask if there is anything you can do to help. Accept whatever answer is given without argument. If you are unclear about how you are supposed to dress, call and ask. You want to make sure you are in appropriate attire. Select a host or hostess gift that can be used after all of the guests leave. Don't expect the host to use it during the party. After all, this is a gift, not a potluck. If you are unable to attend, let the host know as soon as possible. This is essential for planning purposes. Not doing so could cause the host to spend more money than necessary or leave someone else off the guest list. Arrive on time. Being late can throw the entire party off and create additional problems for the host. If you have a problem with being on time, set your watch ahead to make sure you aren't late. Being late is absolutely not acceptable unless you have a flat tire or a medical emergency. Sit where you are asked to sit. You might find a place card on the table with your name on it. There is a reason for this that the host has likely spent hours working on. Wait for the host. You should always wait for the host to begin eating before you pick up your fork. Pass the dish properly. When someone asks for something that is in front of you, pass the dish without taking something from it. Then wait until it comes back around before you help yourself. Don't make a fuss over anything. If you like the food, great! Enjoy. If you have never tried the food, take at least one bite before making a decision. If you know you don't like it, eat the food around it and keep the comments to yourself. Never make a big deal over something you don't care for. As soon as possible, send a thank you note letting the host know how much you enjoyed the party. You may even send a thank you gift if you like.